In the process, John-Williams effectively blocked a grilling over the first Annual Financial Statement he was due to present as president and construction at the TTFA’s new “home of football”—a technical development centre and hotel—and, possibly blocked a vote of no-confidence as well. It is the fifth time—without resolution—that the TTFA’s 2016 financial statement has been on the agenda. 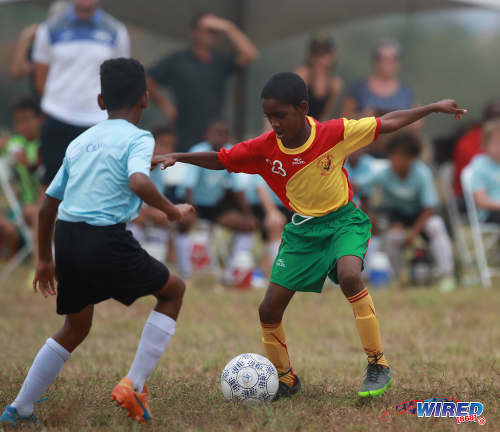 The local football body cannot access FIFA funding, which stands at a minimum of US$750,000 per year, without having had its Financial Statement approved. In the melee thatbroke out in the Ato Boldon Stadium’s Media Room following John-Williams’ announcement, the normally reserved North Zone president Anthony Harford accused the President of “tyranny” while members—including veteran Referees Football Association (TTRFA) vice-president Osmond Downer and Veteran Footballers Foundation (VFFOTT) president Selby Browne—accused the W Connection football club owner of violating the constitution. The TTFA first tried to have its financial statement approved at an extraordinary general meeting on 5 July, 2017 but was forced to postpone the effort as general secretary Justin Latapy-George had not made copies of the document available to members, as mandated by the TTFA Constitution. Photo: TTFA president David John-Williams (centre), media officer Shaun Fuentes (left) and new Soca Warriors coach Dennis Lawrence at the TTFA headquarters on 30 January, 2017. At its AGM on 25 November, 2017, the local football umbrella body tried again; on John-Williams’ instructions, however, financial documents were distributed to one-third of the membership, the President claiming the rest were non-compliant. The general meeting overruled John-Williams and his Board was given 30 days to reconvene the session. For the follow-up meeting, the John-Williams-led Board chose 8am on 23 December, 2017, two days before Christmas. However, although members showed up, the TTFA president stayed home—without warning—and sent word that he was unwell. Vice-president Ewing Davis chaired that meeting on John-Williams’ behalf and tried to have the financial statement approved without the President or financial manager, Tyril Patrick, on hand to answer questions. The membership refused. The reconvened AGM was then set for 20 February and, although John-Williams picked the date, when members turned up, he was again absent. And, yet again, the AGM was postponed. At 8:30am today when Latapy-George took the roll call, there were 17 members present along with John-Williams, Davis and Board representatives Richard Quan Chan and Sharon O’ Brien. 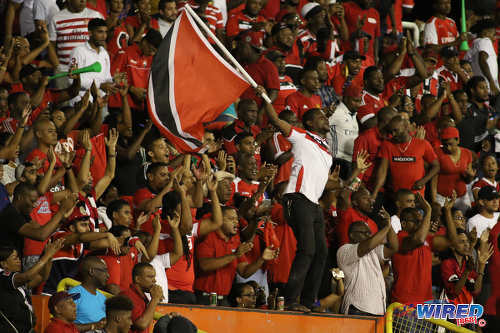 Photo: Trinidad and Tobago football fans enjoy the show during 2018 World Cup qualifying action at the Hasely Crawford Stadium on 24 March, 2017. 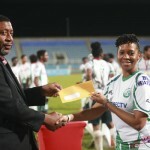 Of the 17, there were representatives from seven Pro League clubs—including the TTFA President’s daughter and current W Connection boss Renée John-Williams—while the remaining 10 delegates came from the various zonal bodies as well as Secondary Schools Football League (SSFL) president William Wallace. John-Williams, who chaired the meeting as president, then got up and, according to several eye-witnesses, announced that it would be “unethical” to proceed without a quorum of at least 24 members. He then abruptly adjourned the meeting for an unspecified date within 14 days. 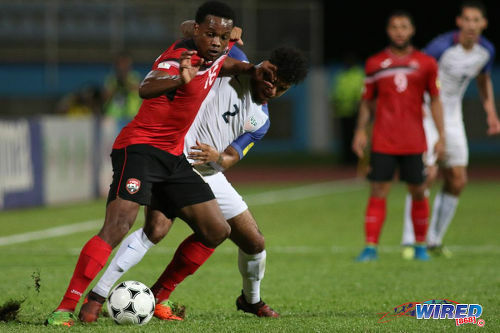 The room erupted as Browne and Downer shouted their opposition, under article 24.3 of the TTFA Constitution, while, banging on a table, John-Williams shouted back. “I pointed out to him that, as chairman, he has no such authority [to adjourn],” said Browne. “The meeting has the authority to take a vote on that and decide… Also there was a duly convened AGM in November for which there was a quorum. Harford said John-Williams recognised no opinion other than his own. “People were explaining to David that a quorum does not matter now because you had a quorum the first time,” said Harford. “A reconvened meeting is just the continuation of the first meeting. It is as if you went for lunch and came back with a member short. “I told David let us listen to the people because the entire floor without exception was saying let us continue; and you are saying only your opinion counts. I told him this is a democracy and what you are displaying is a tyrannical approach. Harford claimed that Renée John-Williams twice stood up and appealed for calm from the floor and head table and urged her father to let the members vote on whether to adjourn the meeting. The TTFA president refused. 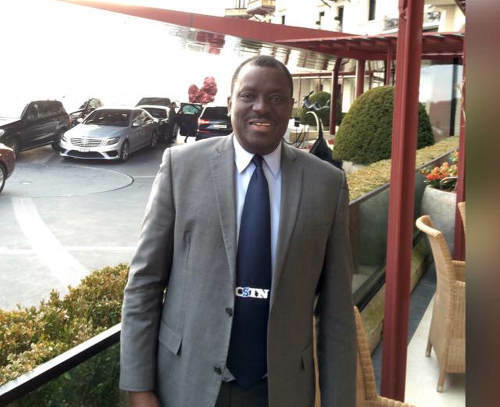 There were raised eyebrows too at the TTFA President’s assertion that it would be “unethical” to proceed with the AGM, in which he was set to be grilled on his financial stewardship of the football body. “[SSFL president] William Wallace, who is a voice of reason, stood up and tried to tell [John-Williams] there is a difference between illegal, unconstitutional and unethical,” said Harford. “Unethical and illegal are two different words. [John-Williams] said it was unethical to start without a quorum. People said okay but it is not illegal, so don’t use the two words in the same context. “[…] The entire floor is saying let us proceed with the vote and here you are saying [to adjourn for] 14 days which could be Easter weekend or Spiritual Baptist Day. Photo: TTFA president David John-Williams weighs up his options during an exhibition match at the Ato Boldon Stadium, Couva on 10 April, 2017. 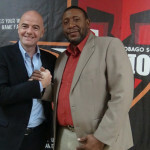 Eastern Football Association (EFA) president Linus Sanchez agreed that John-Williams’ behaviour was unconstitutional. However, he reserved most of his ire for the members who did not show up this morning. Trinidad and Tobago Super League (TTSL) president Keith Look Loy and his FC Santa Rosa club had already committed themselves to a Walk For Peace in Arima, before the TTFA Board picked the date for the AGM. But Sanchez was furious that nobody from the TTSL came in Look Loy’s absence while Central Football Association (CFA) general secretary Clynt Taylor was also a no-show. “Santa Rosa I can understand; but don’t tell me at least three [TTSL] clubs couldn’t send one member to ensure they had representation,” said Sanchez. “And nobody could reach Clynt Taylor from the CFA on his phone. These are the two members who are most vociferous about what happens in TTFA, so now my delegates are wondering if they are just talkers. “The Southern FA had no member. We can understand Tobago because of the ferry [problems] but nobody showed from Eastern Counties… It leaves me to conclude that [administrators] don’t understand their contribution to sport and crime in this country. Photo: Trinidad and Tobago winger Levi Garcia (left) holds off USA right-back DeAndre Yedlin during 2018 World Cup qualifying action in Couva on 10 October, 2017. Sanchez suggested that the absent stakeholders were worse than the supposedly misbehaving football president. “An AGM happens just once a year and we, the members, have absolute power,” he said. “So why in the name of God would you throw your hands in the air and say ‘I ent able with that’ when it is time for an AGM? Today’s adjourned meeting meant another wasted trip for the bemused representative from auditing firm Madan Ramnarine and Company as well as accounting advisor Robert Reis. It is likely that the TTFA will still be billed for their presence. 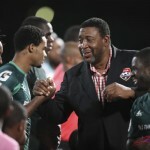 Members filed out of the Ato Boldon Stadium in disgust while Browne and Downer urged them to remain for a meeting without the president as happened during his first no-show. Some members vowed that they would not return. However, Sanchez noted that, if members became frustrated and stayed away, John-Williams could conceivably use his “unconstitutional approach” as strategy by continually reconvening meetings until only his supporters are present. 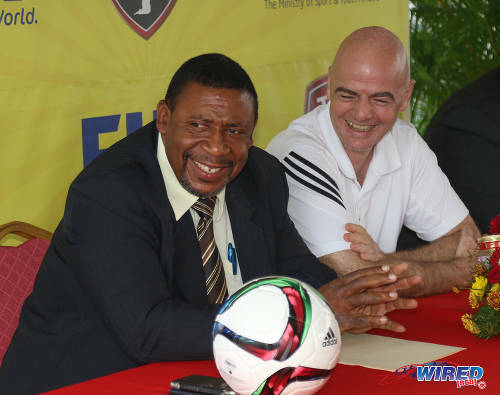 Photo: FIFA president Gianni Infantino (right) and TTFA president David John-Williams at a media conference at the Ato Boldon Stadium in Couva on 10 April, 2017. 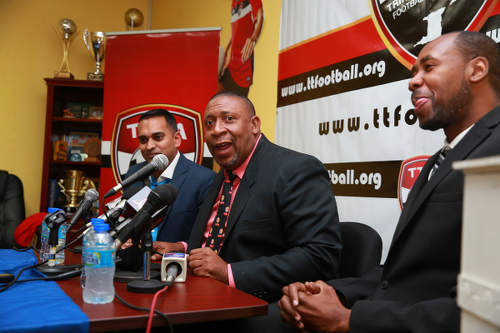 “The next time [the TTFA president] tries this, we will appoint a chairperson and proceed with the meeting,” said Sanchez. “If the President scans the crowd and feels he doesn’t have support and adjourns, we will have a meeting anyway in accordance with the constitution. Browne suggested John-Williams’ decision might have been made to head off a possible no confidence motion, although the constitution does not allow a vote for the removal of a member—including the president—without it being first put on the agenda. Still, the VFFOTT president said he hopes FIFA intervenes in the impasse. Harford had hoped to discuss the lack of financial support for the zonal bodies or inter-zonal competition, particularly at youth level. Photo: Trendsetter Hawks winger Keefe Edwards (right) takes on a QPCC opponent during RBNYL action at the Queen’s Park Savannah on 15 May, 2017. 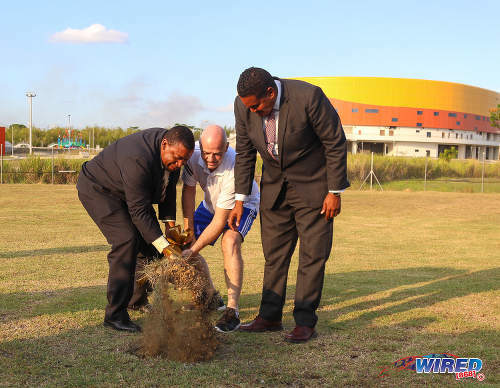 The lack of clarity on the TTFA’s “Home of Football,” which has already benefited from a TT$2.6 million FIFA grant, is another major concern for stakeholders. John-Williams, who is a contractor, has been seen on the site for long hours as workers toiled on the project. 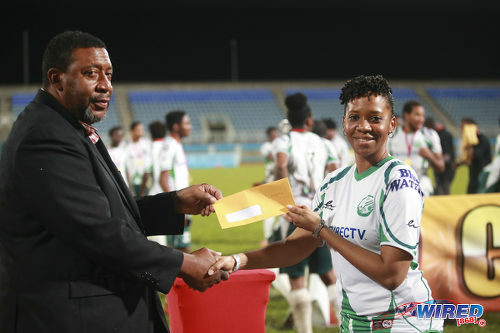 Yet nobody seems to know who was awarded the contract for the project while a Sport Company source said the TTFA President has so far failed to respond to a request for information from SPORTT acting CEO Jason Williams. Harford, who is also director of sports management group All Sports Promotion, suggested that today’s chaotic meeting might actually be another sign of progress from the Jack Warner era, when the football president’s rule was unquestioned. “The one thing I can say is what is happening is probably healthy,” said Harford. “We have reached a place where we realise the days of people going in and bowing to the head table have gone. We are in that transition phase. 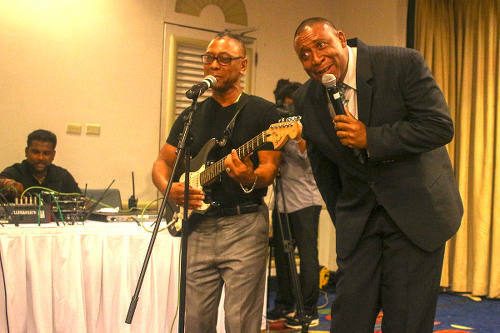 Photo: Trinidad and Tobago Football Association (TTFA) president David John-Williams (right) performs a duet with former Calypso Monarch, Cro Cro at the launch of the National Elite Youth Development Program at the Trinidad Hilton on 14 October, 2016. Neither the TTFA president nor his daughter responded to requests from Wired868 for comment on the former’s decision to adjourn the AGM. President John-Williams also did not respond when asked if he was deliberately trying to avoid taking questions on the football body’s spending and construction work on its technical centre. I am upset with myself for being surprised. Dion nobody knew the man was going to turn out like that c’mon now!! Based on what he did with Connection we thought he would have been a good fit (at least I did) plus I knew him from back in the day when WConnection was a fete match side and he would take an interest in the youths in the Plaisance Park area. His about turn was a shock to me as it was a kick in the teeth …. but that’s neither here nor there we know who (what) he is and we need him gone with pure prejudice. David John Williams we want you gone!!! All of us want you removed!!! I agree with you Keith LookLoy…i know your work ethic. ..SOME of us are. Not all.. I get tired of reading the ridicoulous dictatorships by most of these sporting organisations. We as Trinidadians are talkers. If we wanted change we would make it happen. It is obvious that he is not following the constitution so there are remedies for that. Use the courts to wrestle control from these people and file for legal costs. I mean how much longer will this go on? We are keyboard warriors and are not serious. ..SOME people did. Not all.. Instead of change we got an exchange! The more management(TTFA) change is the more things remain the same!! I thought Jack was the problem in our football?? How these people reach there…WHO put them there???? The Tyrant will always find prefix for his Tyranny….. Our football has no hope with this gentleman. He sounds like Trump. Appearing to do wrong and not a dorg bark? He mad or what? the 2015 Financial Statements published by DJW though of the Tim Kee period included some questionable entries and adjustments. And to think that for many other federations, yuh could just go on dey website and download dey financial reports. There are degrees/courses in sports governance. We need to bring a higher level of professionalism to the administration of sports in T&T. What is the year of the last audited financial report for the TTFA? The last approved statement was in 2015. Remember DJW had that one published in the press and everyone said he was the most transparent official of all time? Not many realised that the 2015 statement only read had the spending of his predecessor, Raymond Tim Kee. Ok. I remember that one. Unethical to be called to give an account for his stewardship. WTH I hearing boy. I would think that for anyone working in finance that is expected. Pray tell is it that the gentleman has something to hide. I am just thinking out loud. Is it that everyone of out institutions need an overhaul. Madness. Ah give up!!! Ah cyar battle two tyrrants in mih lifetime…..whey de yutes? ?…..is dem turn….I too ole for this ish!!!! Why is it that we continue to suffer while King David and his ilk continue to be poster-children for maximum-leadership and rank incompetence? It is said people usually get the leaders we deserve but I wonder what the hell have we done to be deserving of this! This man needs to step down or be forced out! Not surprised. He thinks this is W Connection where he can make unilateral decisions unopposed. I said it from the get-go: He is a dictator! Same crap as in the fullness of time.. This all falls squarely on the shoulders of the membership. People want the benefits associated with membership, but show no appetite for assuming any of the responsibilities. I’ve been critical of Selby in the past, but he’s rapidly emerging as one of the few thought leaders in the organization. He had it spot on in this case, the members should have remained and continued the meeting. Further, as a correction, a motion for dismissal does not need to first be put on the agenda for there to be a vote. They should have remained and voted to either suspend or expel Williams. How do you read Article 38 then? 1 The General Meeting may dismiss a person or a member of a body. The Board of Directors may place the dismissal of a person or a member of a body on the agenda for the General Meeting. The Board of Directors may also dismiss a person or a member of a body provisionally. Any Board of Directors Member may submit a proposal to place such a motion for dismissal on the agenda of the Board of Directors or General Meeting. 2 The motion for dismissal must be justified. It will be sent to the Members of the Board of Directors and/or to the Members along with the agenda. 3 The person or body in question has the right to defend him- or herself. Lasana, note the “may,” rather than “shall.” In statutory construction, shall indicates an imperative, while ‘may’ means that it is discretionary. This was no mistake. The Report of the Independent Reform Commission, which formed the basis of the current TTFA Constitution, also deals with suspension and dismissal. There is no contemplation of the item having to first be placed on the agenda before voting on the matter. This is heading for the Courts. This clause as well as others may need amendments to narrow it down to make it enforceable. What does valid votes mean? How do you place dismissal on the agenda? Does it need to be approved by someone first? Too wide to interpret in my opinion. Exactly Lester. Does “valid votes” means votes from all 49 delegates? Or just the people present on that day? Must there be quorum? Or can it be done in a reconvened meeting? Bring out lawyer money yes! If DJW has a shred of honour, he would use his own finances rather than football money to defend himself here. It’s not exactly clear what “valid” votes means. It could mean the votes of members in good standing (thinking specifically about the challenge to the validity of Williams’ election) or it could mean any vote by more than 50% of the membership. Whoa! 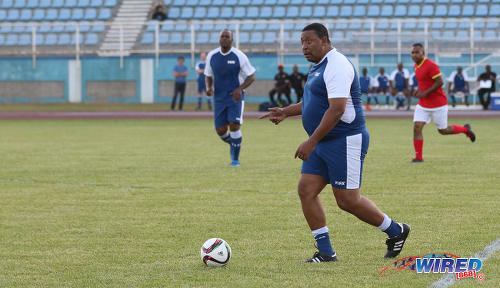 So, question – is there any area of sporting activity that people in the know can claim is well managed in T&T? I thought that, even as I was making the comment! Kinda sad! Don’t wait for him to resign… get him out. Allyuh can’t even get him to hold a meeting allyuh calling on him to resign? I understand such a ‘call’ might purely be rhetorical, but it is past time that the membership acts. Under Jack Warner power and authority was centralized to a few cronies who rubber stamped his will. Under Tim Kee that was changed to give members more authority and direct say in the governance of the body. What is the membership doing with the newly-restored authority? Why huff and puff and walk out instead of staying and taking action? Seems like the members need a primer in understanding the very constitution they support. Why shouldn’t a motion to dismiss him be pushed forward? It’s long overdue and his movements surely inspire a vote of “no confidence” ….. By all the members not just one member. He’s a stain on our footballing pedigree … whatever is left of it. ..The apple falls when gravity pulls it to earth..
Well that millstone pulling everything to earth while we waiting fuh apple to fall.
. Bro. It took us from 1494 to 1962 to gain independence. Nothing before its time no matter how hard you wish it. You work and the time will come..
Keith I hope that this is not another bluff and old talk. John Williams has gone way overboard. Jack was a dictator when football needed one, and got things done. He is trying to be a dictator but has no clue how to get things done, or to improve our football. He must go NOW. To call this farcical now, when it is way beyond farcical makes me wonder if we are trying to be cynical. This runaway unconstitutional madness must trigger a vote of no confidence with or without the presence of the person in charge. LasanaLiburd, Where was the General Secretary? ..The GS is a functionary with no weight in John-Williams scheme of things.. The General Secretary has no role or powers in matters of governance, the purview of the GS is administrative and operational. this falls squarely on the membership. Administrative and operational as in being able to advise or remind the President of the Constitutionality of his decision? As in the daily running of the organization. He can advise on Constitutionality, but that’s not in the Constitution. Anybody can advise (his own daughter did today) but the President doesn’t have to listen to anybody but the ExCo and General body. Gotcha. This debacle is pushing TTFA constitutional reform again to the front burner. ..I have said here previously that you guys keep discussing goings on in football and sport from a ratonal/legal standpoint. The “logic” of football is POLITICAL. It cannot be followed or understood from any other. The general rule is that the GS follows orders from the “big boss” and serves that interest..
Brian the Constitution might need a tweak here and there if anything, the problem is that the current administration treats it as little more than a novelty. It is up to the members to police and enforce it. Everybody seems happy to wear the title and show up for a meeting every now and then, but uninterested in any of the heavy lifting necessary. ..”the Constitution might need a tweak here and there if anything, the problem is that the current administration treats it as little more than a novelty. It is up to the members to police and enforce it. Everybody seems happy to wear the title and show up for a meeting every now and then, but uninterested in any of the heavy lifting necessary.”. That’s politics. You could change the constitution how you want, the “big bosses” use selected members to subvert it. Trips. Positions. Per diems. You know the deal.. So then it goes back to what I said from jump… this falls squarely on the shoulders of the members. The United Nations released a survey that listed Trinidad as the happiest Caribbean country to live in.